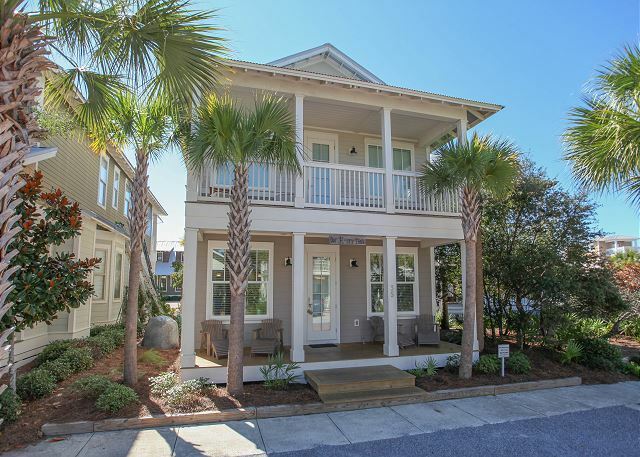 Constructed in 2014, Our Happy Place is located in popular Seacrest, snuggled in between Alys and Rosemary Beach. Surrounded by endless dining, shopping and entertainment, your family can always find something to do. Opt for walking 10 minutes to the beach or hop on the complimentary shuttle service (runs seasonally). You will pass the centrally located lagoon pool, the highlight of many visitors stay. Your family will be welcomed into the living, dining and kitchen great room with full view of the 40” television. Out the back door, there’s a gas grill and garage where you can park your car or store your beach gear. One queen master bedroom with a private bath, laundry and powder room round out the lower level. Upstairs, the loft has a sleeper sofa and wall-mounted TV. Combined with a bunkroom, this space is ready for your little ones. The king master is around the corner with a private balcony, setting the scene for some quiet, adult time. This floor plan has two upper queen guest rooms. In a family-rich community with much to offer, this lovely, new home is sure to make summer days seem endless.